Another proposal is looming that involves resilience and the future of the electric grid. This one has nothing to do with coal piles. Rather, it's narrowly focused on the grid's edge, in a small neighborhood on Chicago's South Side. That's where Commonwealth Edison Co., one of the nation's largest electric utilities, wants to build a demonstration microgrid that would provide lessons about distributed energy resources and the role they'll play in the future of one of the nation's largest cities. The $29.6 million cost is modest for a utility of ComEd's size. Yet the proposal has drawn scrutiny from consumer and clean energy groups. While they agree on the need to modernize electricity infrastructure in a way that minimizes costs and cuts emissions, some of them say ComEd's microgrid plans miss the mark. The case before the Illinois Commerce Commission includes testimony by experts from across the country. It's raised issues about the role of urban microgrids, the benefits and who pays for them. Another question being asked is what is the role of a monopoly utility in developing microgrids? "I think that's a huge open question, and it's an open question around the country," said David Kolata, executive director of the Citizens Utility Board, a Chicago-based utility watchdog group that's a party in the case. ComEd said microgrids are among technologies at the forefront of the electric industry's transformation, and the project covering several blocks in Chicago's Bronzeville neighborhood will benefit both customers and the public at a cost to ratepayers of just "pennies a year." "The project will enable ComEd, the commission and stakeholders to better understand the benefits of microgrids, their design, operation, and integration with (distributed energy resources) and their operation in an integrated cluster," the utility said in its petition to the ICC. And the lessons to be learned "can only be fully explored through actual operation of a microgrid and real world interactions with a range of customers and energy resources." Critics, however, say the proposed microgrid is poorly conceived, it relies too heavily on natural gas and diesel generation, and that ComEd hasn't shown that the project will deliver benefits to justify its cost. "ComEd's failure to quantify the purported benefits ratepayers would realize show that the project is not cost-effective, is not prudent and it would be unreasonable for the commission to approve it," Attorney General Lisa Madigan's office wrote in a filing asking the ICC to reject the application. The attorney general's office said the utility's promise that lessons will be learned from the project is vague and overstated. In reality, it said, the microgrid would benefit only the few residents and businesses within its small footprint, while all of ComEd's nearly 4 million customers would pay for it. An administrative law judge is expected to issue a proposed ruling in the case today, and the ICC will follow with a decision in the coming weeks. ComEd officials declined to discuss the microgrid proposal pending today's order, but a spokesman provided email responses to several questions. Chicago-based ComEd began its pursuit of microgrid funding two years ago when it proposed legislation that included $250 million for six microgrids across its service area. The request was trimmed to a single $50 million project during legislative negotiations. Gov. Bruce Rauner (R) insisted that the microgrid, among other provisions, be cut out of the Future Energy Jobs Act later passed by the General Assembly in December 2016 (Energywire, Nov. 23, 2016). The loss of funding was a small consolation for ComEd as the sweeping energy law paved the way for more than $2 billion in subsidies over the next decade to aid a pair of nuclear plants owned by parent Exelon Corp. The utility tried a new approach last summer by going to state utility regulators for approval of the Bronzeville microgrid (Climatewire, June 6, 2016). The two-phase project would serve an area with 1,060 residential, commercial and small industrial customers in a 0.29-square-mile area of the south Chicago neighborhood with an aggregate demand of 7 megawatts. Included are "critical public service customers" such as the Chicago Police Department headquarters and nursing homes. The initial $8 million phase would include at least 750 kilowatts of solar and 500 kW/2 megawatt-hours of battery storage. Half the funding would come from a Department of Energy grant. The second phase would cost $17 million and add 7 MW of generation, including gas- and diesel-powered turbines. 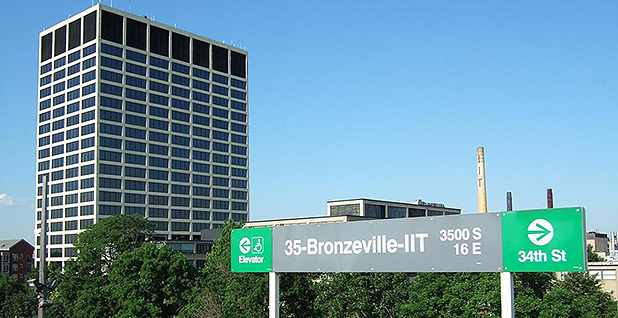 ComEd would also interconnect the project with an adjacent microgrid at the Illinois Institute of Technology (IIT) to demonstrate microgrid "clustering." Once complete, the project will have enough generation to maintain service when the microgrid is "islanded" from the main ComEd grid, the utility said. Like the axiom about real estate, a focus of the ComEd microgrid case has been on location. ComEd said it chose the site after an in-depth analysis to identify locations that would most benefit from the added resiliency. The site was also selected because it's next to the IIT microgrid and would provide lessons about linking microgrids. Robert Kelter, an attorney representing the Chicago-based Environmental Law and Policy Center and Vote Solar, said the location selected by ComEd limits the project's benefits. The area has above-average reliability, according to the utility's own metrics. And there are limited resources in the neighborhood to provide a haven for people in surrounding areas in the event of an extended outage, Kelter said. "When you have a cyberattack or a storm that knocks out power for weeks, people need money, they need food, they need to be able to get the basics," he said. ELPC and Vote Solar also question ComEd's decision to rely heavily on gas and diesel generators for the second phase of the project. "Running a microgrid with 7 MW of gas and diesel generation in Bronzeville is like promising a Tesla, and then delivering an Oldsmobile," the parties said in a brief. The groups recommended that the ICC approve the initial phase of the microgrid, but hold off on the second phase until the utility agrees with other parties on goals, objectives and outcomes to be achieved. The ICC staff likewise questioned ComEd's plans for the second phase of the project. The commission staff recommended allowing an expansion of the first phase of the microgrid but said regulators should deny the second phase because the utility "hasn't proven this to be a prudent expenditure." While ComEd still maintains the location it chose is ideal, the utility did agree to a couple of changes to win conditional support from the Citizens Utility Board and the Environmental Defense Fund. A key concern when the project was introduced was ComEd's plan to own the generation associated with the project. Parties in the case raised concerns, noting that utilities aren't allowed to own power plants following a law that restructured the Illinois retail electric market 20 years ago. ComEd has since altered its proposal and will take bids to utilize third-party-owned generation assets as part of the microgrid. If no suitable ones are received, ComEd said it will lease them. David O'Dowd, a ComEd spokesman, confirmed that if the commission approves the project as proposed, the utility will work with CUB and EDF to develop a pilot microgrid services tariff and file it with the commission by Jan. 1, 2020. Kolata said he's hopeful the Bronzeville project will help ComEd and the state build on key policy choices in recent years, the 2011 smart grid law as well as more recent energy bills that will significantly expand development of renewable energy. Ultimately, a microgrid tariff could end up being a service provided by utilities to "island" a part of the grid in the event of a disruption. "We do want and need to start doing pilots that get at the question: Is there a consumer value proposition with microgrids?" he said. "There's just a lot of thorny policy questions. We thought that if you structure a pilot right, you can get at some of those questions."